When I went to Paris in June the beginning of the trip was full of rainy days and sunny evenings, then progressed into super hot weather. On my second day there I met my friend Laura, who was traveling to Paris on business, and we went over to the Passy area to do some shopping. When the weather went from kind of rainy to an absolute downpour we literally dove into an agnes b. shop to escape. I became completely enchanted with this lovely crochet style knit marie dress, which luckily for me was part of the government regulated sale season. But I didn't buy it. It was the first thing I tried on during my trip and I just felt I needed to look around. I don't usually hesitate when I love something. I am blaming jet lag. By the next day I regretted not purchasing the dress and the rest of the trip I looked for another agnés b. shop to find it. Lucky for little Miss Indecision here, my friend Monica arrived in Paris after I left and found it for me, marked down even further. A happy ending and a blog post was born. You can still find this little beauty on sale here! White dresses are the quintessential summer look to me. I love the freshness of a white dress and the simply chic of white itself. Layering different textures of white give it additional interest. The lovely thing about a great white dress is you can wear them to a party with sandals or summer wedges, or run around in the day with a pair of sneakers. Speaking of sneakers, these Nike Classic Cortez Sneakers are my current favorite. I love the all white with the black swoosh. I had an original pair of the red white and blue pair back in the day when that was basically what you bought from Nike because that was their shoe. These babies are not expensive and they go with everything. The bag I have been carrying all summer is my Issey Miyake Bao Bao Bag and it my absolute favorite tote. The classic geometric design make this a stand out piece and adds interesting texture to whatever I am wearing. It also goes totally flat when empty so it is a great bag to pack for a trip. Coolest bag ever. A white dress can take you from a terrific summer into fall as well. Layer it under a jacket or sweater, add a cropped leather or denim jacket and you have a modern transition piece. That rule about not wearing white after Labor Day? Old and outdated and does not apply. Toss it out the window and wear white all year long. I am completely in love with LoveShackFancy's Rebecca Dress. It is bohemian, it is modern vintage, it is ultra feminine. I can see this dress with wrap tie sandals or a really cool bootie and leather jacket. Love. Alice + Olivia always does dresses right. If you weren't wowed by the black lace detail of this beautiful Alice + Olivia Rozzi Dress then you may be enticed by the sale price. It is 60% off at Nordstrom right now. Wear it now and then stash it away for next spring! The A.L.C. 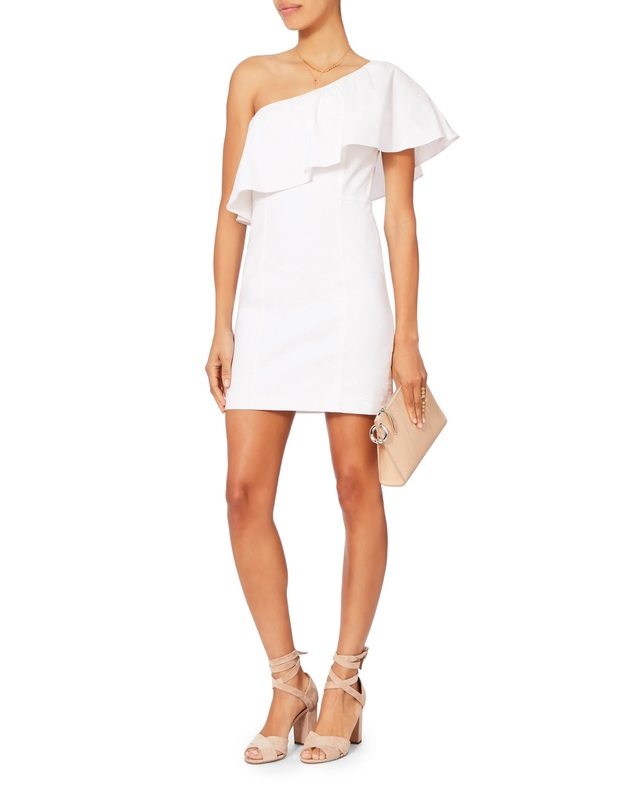 Evan One Shoulder Dress is a pretty charming way to show off a summer shoulder in a different way. It has clean lines for those of you ladies that shy away from too much embellishment, and could easily go from day to night. It is also on sale at Intermix! Self Portrait is one of those labels that has next level pieces that are distinctly them. This Monochrome Asymmetrical Wrap Dress is one of those dresses that stands out and is not typical in any way. I have seen this styled with black tights as well, making it another beautiful dress that could transition to the next season. Finally, a shirt dress is a closet staple, but that doesn't mean it has to be boring. I wore mine all over Europe last summer and on through the rest of the summer. This Anthropologie Wrapped Midi Shirt Dress is the perfect way to look cool but professional during office hours, and it will get you through a busy weekend. It is one of those must haves that really is a must have.